Rafael Benitez has apologised to the fans at Liverpool Football Club for the current poor performance of the team. They are 7th in the Premier League and apparently that’s not good enough. To make matters worse they were beaten this week by Reading – who are near the bottom of the Championship (one league below Liverpool). But hang on a minute, shouldn’t we put things in perspective? The Premier League is the foremost football league in the world; it has the richest teams, the best players and the biggest TV audience worldwide, bar none. So, being 7th in the top league in the world is rather excellent, is it not? After all there are 13 teams worse than Liverpool in that top league in the world. There are thousands of professional soccer clubs around the world who are much, much worse than Liverpool. Fans of positive thinking would be encouraging Liverpool to “look on the bright side” and to see that being 7th is not negative at all – but something to be proud of. After all, are you 7th in the world in your profession? You’d love it if you were…! Yet, in the world of the Premier League being 7th is nothing; it’s not noticeable in Europe, the sponsors will pay you less and you’ll even lose fans whose loyalty cannot be guaranteed if you are not in the top three or four of the league. Indeed, there is a chasm between the top four clubs in the UK Premier League and the rest of professional football. And in your business world it’s exactly the same. Over at Google, if you are not in the top four positions of the search results page for any given keyword search you are nowhere. Studies have consistently shown that 80% of all clicks on a Google search results page go to the top four results. So, rather like Liverpool Football Club, you are nowhere if you are not one of the Four Tops. So, how can you deal with that? Some people may suggest that going for “pay per click” (advertising) is a short-term fix. Pay for attention, they say, while you sort out your website and get its ranking improved. But when you analyse the adverts on Google and other search engines you find similar data; if you are not in the Top Four adverts, you are nowhere. So, the PPC route could end up being very expensive. Of course, you could try “search engine optimisation”; that’s a fancy name for “doing the right thing”. Many so-called SEO experts have made this a rather black art and brought the whole field into disrepute. All you have to do is find out for yourself the differences between the websites that get ranked at Number One for any search term and those that rank Number Five. If, for instance, you search for “Liverpool Football Club” you discover the usual mix of results. Top of the table here is the Premier League itself, closely followed by the Dallas Morning News, the Liverpool site itself and then the main fan site. Check out some of the data from these website and you’ll find several common features shared by these sites, that are not the same for the sites lower down the Google results. The sites high up search engine rankings tend to have large numbers of pages. Google “weighs things by the pound”; the more pages you have, the more valuable you are perceived to be. The top results also have large numbers of links, with the greatest proportion of those links being “anchored” by the phrase that was searched for. 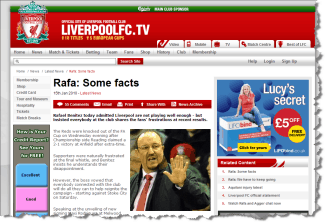 Others, down the results page may have more links overall, but fewer of those links, in this example, will be for “Liverpool Football Club”. At the highest positions you also find sites that are updated most frequently; regular updates – and several of them – gets Google’s attention. Regular updates of your website – add content more frequently than your competitors. So, what does this mean in reality? It means you can win the search engine battle by adding to content to your website constantly and then share that content with social networking sites. In return you get a site that has loads of pages and which grows every week – and you’ll get loads of keyword-related links. The answer to your search engine woes is simple. The answer to Liverpool’s woes is simple too – just play better than their competitors. And in reality that’s all you have to do to get into the Top Four on Google. It’s the real thing…Coke says so…!